EE Bookshelf: Interconnecting Smart Objects with IP « Adafruit Industries – Makers, hackers, artists, designers and engineers! 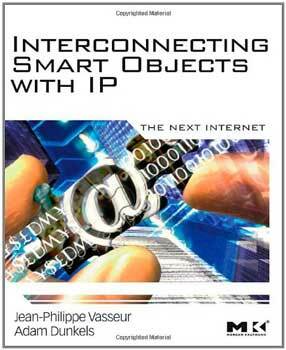 Admittedly, Interconnecting Smart Objects with IP [ISBN: 0123751659] by Jean-Philippe Vasseur and Adam Dunkels (of lwip and Contiki fame) deservedly made the rounds a while back, so we might seem a bit late on the draw pointing it out again here. But while I haven’t been doing anything with wireless lately myself — that’s much more the domain of the always knowledgable Akiba over at Freaklabs, who I’m always happy to defer to — I pulled this book out again this month for something else. It goes into a lot of valuable detail on what it takes to implement a complete wireless sensor network infrastructure and it’s well worth the investment if you have any interest in WSNs, but an unexpected bonus for me the first time I read the book is that it also gives you an excellent overview of all the little pieces that fit into IP-based networking of any type … and there are a lot of pieces in that puzzle! If you’re interested in getting started with IPv4 or IPv6 and Ethernet, there is a lot of information out there, but I was surprised to find Vasseur and Dunkels’ summary one of the most readable and accessible introductions that I’ve encountered, giving you a good understanding of the glue that holds everything together. Trying to add wireless OR wired network connectivity to your next great idea of project? You could do worse than spend an evening with this book and a good highlighter.